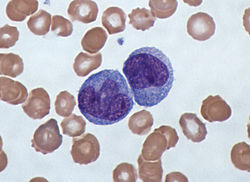 Monocytes are a teep o leukocyte, or white bluid cell. Thay are the lairgest teep o leukocyte an can differentiate intae macrophages an myeloid lineage dendritic cells. As a pairt o the vertebrate innate immune seestem monocytes an aw influence the process o adaptive immunity. Thare are at least three subclasses o monocytes in human bluid based on thair phenoteepic receptors. This page wis last eeditit on 5 Dizember 2018, at 23:54.